(1) hear the Word of God, (2) respond to it actively, (3) debrief and interpret the experience together. Recently, some Middlebury students studied the feeding of the 5,000 in Matthew 14 (hearing the Word). 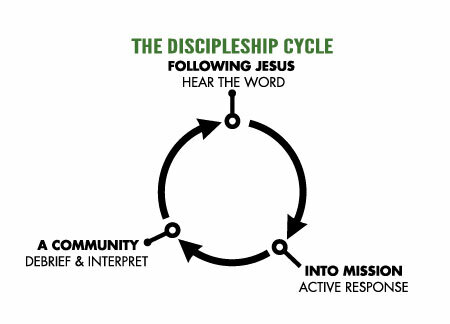 We saw how Jesus entrusted to his 12 disciples the task of feeding his huge audience (they only had a few loaves of bread and fish). Yet Jesus used what little the disciples had to satisfy everyone. We wanted to see what it might be like to bless the people around us and trust God in a similar way. Equipped with a few games and snacks, we split up and went into different parts of campus to start a surprise party/study break (active response). We asked God to use our small gifts to bless others, build relationships, grow our faith and point to Jesus (the true Host of the party). We invited friends and strangers to join us at the party. Many came. Some took food and left, but most stayed, talked and played games, and some heard about Jesus and learned why we were doing this unusual thing. For cynical students, it can be transformative to see how the gospel motivates Christians to serve selflessly. And for Christian students, it can be transformative to follow Jesus out of our safe meeting spaces into the campus (where God is already at work). One freshman student remarked, “The experience was new, at times scary, nerve-racking – but it was a humbling experience. I realized there’s so much room for me to grow to trust Jesus more!”(debrief and interpret). God is causing new faith to rise up in these students!